Macpherson cards an incredible 11-under 61 en route to victory. 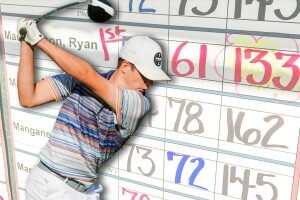 Chandler’s Ryan Macpherson erased a five-stroke deficit after round one with an 11-under-par 61 to take top honors in the Boys Championship Division at the Mesa City Slim Chickens/IMG Junior World Qualifier held June 28-29 at Dobson Ranch Golf Course. He finished the tournament at 11-under-par 133 (72-61), three strokes ahead of Scottsdale’s Max Engel who finished at 8-under par (71-65—136). Hayden Sayre (68-69—137) of Phoenix prevailed over Mahanth Chirravuri of Chandler in a scorecard playoff to take third place at 7-under par. Toni St John of Gilbert (74-69—143) fired the low round of the tournament on the girls side, 3-under-par 69, to win the Girls Championship Division at 1-under par for the event, two strokes ahead of Alexandra Quihuis of Tucson (74-71—145). Alyzzah Vakasiuola of San Tan Valley came in third place at 3-over par (75-72—147). Tyler Macpherson of Gilbert won the Boys 15-18 Division in a playoff at 2-under par (73-72—145) over Andy Knoll of Scottsdale. Gavin Aurilia of Phoenix won in the Boys 13-14 Division at 4-under par (70-70—140). Carlos Astiazaran of Tucson shot 5-under par (69-68—137) to win the Boys 11-12 Division. And Alec Hilgers (71-73—144) of Litchfield Park won the Boys 10 and Under Division in a playoff over Brennan Korn of Phoenix (72-72—144). Reyna Hernandez of Gilbert won in the Girls 15-18 Division, posting a 7-over-par 151 (76-75). Sneha Yadav (77-73—150, +6) of Scottsdale won the Girls 13-14 Division in a playoff over Katie Stinchcomb of Cave Creek. And Gracie McGovern of Scottsdale won the Girls 11-12 Division at 2-over par (72-72—144).